There is nothing wrong with living with a little flair every now and then. Love your style and it won’t matter if any ones else does or not. Doing the Menage A Tarot podcast is one of the best things that’s ever happened. I am truly grateful. One of the things we’ve been talking about is connecting pure intuition to our Tarot practice. Stay tuned…cool stuff in the works for the next episode or two. This month’s card is a bit of an example. 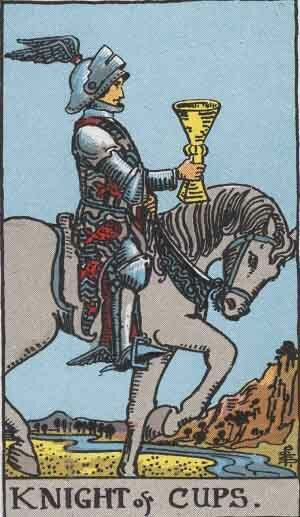 Interpretations for the Knight of Cups range from ” a sensitive blond man with blue or green eyes” (Ellen Dugan) to “Arrival, a messenger approaches” (Edward Waite) to “sufficiency” (Diane Morgan) to “following your heart” (lovely Daily Tarot Girl & Menage A Tarot co-host Kate). Taking cues from multiple Tarot conversations & readings lately, (like this genius one) I set aside all of the “meanings” for the card. Being a word nerd writer type, I love starting with the “meanings” as a springboard, and then moving to the visuals on the card and knitting in the pure intuition. But it pays to change things up. This time I just went pure intuition right off the bat. The impression was “show your style”. The feeling was to live in unbridled authenticity. And as icing on the synchronicity cake, Nicole Cody posted a brilliant piece about “Batman or Ironman, which one are you?” Do you live a double life filled with secrecy and hidden identity (even from yourself?) Or are you “out” as can be, you are who you are, no secrets. Nicole said she identified with both…Batman before but growing into Ironman. I have to agree. I used to be Batman, not letting anyone know about the Tarot thing and a zillion other things. But cue “Back in Black” … being “Ironman” is SOOOO much more fun! What is your style? Do you have a streak of Tony Stark you like to channel every now and then? Richard Bach suggested a similar concept – I think it was in “Bridge Across Forever”…but if you a fictional character, what would you be like? Pick a genre, or or your favorite fictional ‘universe”…then create yourself as a character in that ‘verse. Don’t try to be like an existing character…create YOU within that construct. If YOU were YOU but within Harry Potter’s world, what kind of witch or wizard would you be? If you were you in the Marvel universe, what kind of superhero would you be? If you could be an outlandish fictional character for a day, what would that character be like? Ok…now what’s stopping you from adding elements of that to your personal life? I’m not suggesting you show up to work in a red metal robot suit, but if you want to invent something (preferably legal and nonradioactive) in your spare time, why not? It may not be Tony Stark level stuff, but fixing a squeeky garage door might make you someone’s hero too, you know? Know your style. Show your style. Authenticity is liberating. And fun.